Morocco's national airline RAM launched on April 4, an air service with Athens (Greece). According to Habiba Laklalech, deputy director general of RAM, "this new service will connect Athens with 33 destinations in Africa and all other destinations in the United States, Canada and Brazil, among others. 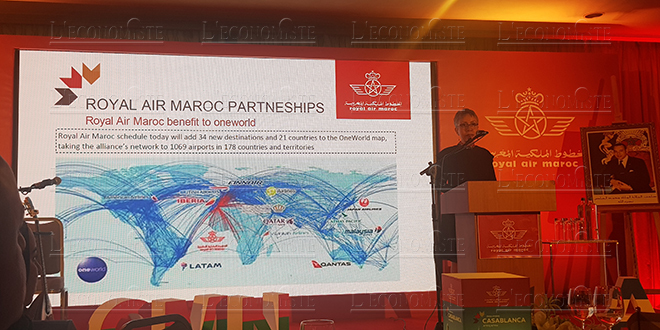 This link will also strengthen tourist flows between Greece and Morocco and connect Athens to more than 19 destinations in Morocco. Indeed, the company offers two flights per week between its base in Casablanca-MohammedV and the Athens-Eleftherios Venizelos airport, operated by Boeing 737-700 and Embraer E-90 (with capacities of 114 and 98 seats, respectively). can accommodate 12 passengers in Business class. Departures are scheduled for Thursday and Saturday at 11:00 (GMT) to arrive at 15:05 (GMT), the return flights leaving the Greek capital at 16:05 (GMT) to land at 20:30 (GMT). To promote its new service, the RAM in partnership with the Embassy of Morocco, organised a large welcoming ceremony at the Athens International Airport. The event was attended by representatives of several Moroccan and Greek media. Enough to bring an air link but also diplomatic progress, promoting "the promotion of tourism and economic exchanges between operators of the two countries," said Samir Addahre, ambassador of Morocco in Athens.